Kinetic Sand Recipe that is easy to make at home! You can learn how to make kinetic sand, at least a copycat version, below and enjoy a fun way for at home sand play. 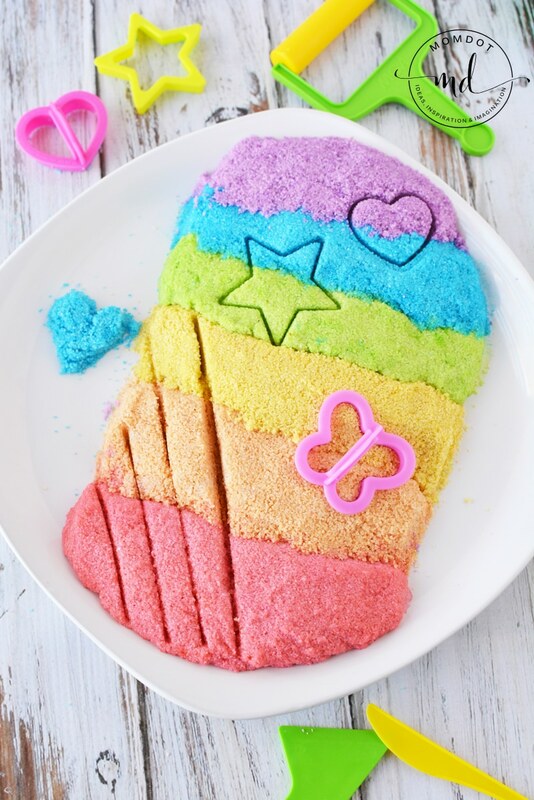 See below for the recipe and get started on some rainbow sand today! When it comes to at home crafting, there are so many ways for messy and fun play. There are slime recipes, edible play dough recipes, and everything in between but as someone that lives in the south, sand has my heart. I don’t necessarily want it all over my car from the beach, but I love how fun and creative it is to play with. The thing is, we cannot get to the beach every week (and right now its winter and cold) so learning how to make kinetic sand at home is one thing that keeps everyone busy until we can get back to real sand and ocean water! When I first discovered Kinetic sand I knew how fun it was! At sand that stays wet and easy to play with at home, holding shape and crumbling down, is a total winner for busy time. And although I do like to buy the store version (we really like Kinetic Rock ), being able to pick and dye our own colors as well as the science portion of the recipe is super fun for my kids. Basically “kinetic” sand is the name given to a regular fine grain sand that has been coated with polymer (non-toxic, synthetic polymer) or in other words, a slick silicone oil. Most speculate its a construction material and helps the sand almost magnetize to one another. 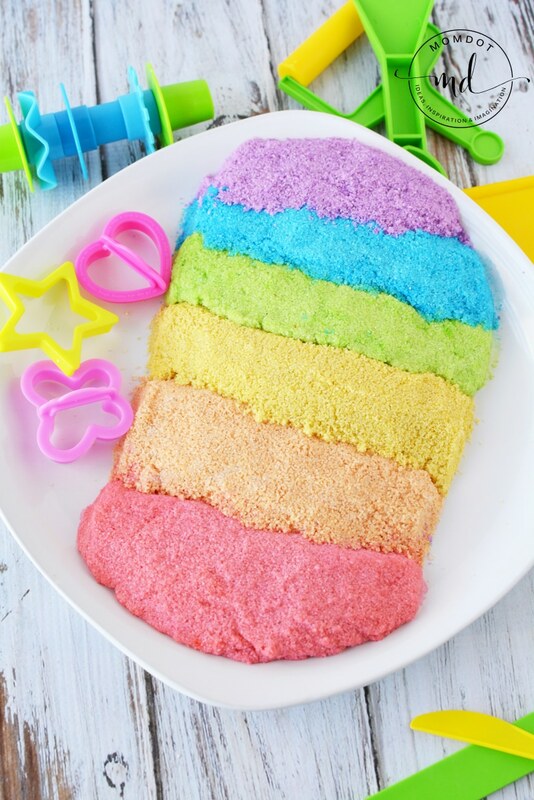 Although its nontoxic, its not considered edible and neither is this kinetic sand recipe. Kids should always be supervised or old enough to know not to put their fingers in their mouths when working with soaps and starches. The awesome thing is you can make your own kinetic sand recipe right at home with simple house hold ingredients. The only thing that most people do not have on the ready is sand and you can usually pick that up at Lowe’s or Home Depot in the garden department, purchase jar sand at hobby stores like Micheal’s and Hobby Lobby (also in dyed colors) or order Sand online. To make rainbow kinetic sand, I used McCormick Neon Food Coloring as well as the standard Red, Yellow, Green & Blue Food Coloring Colors. 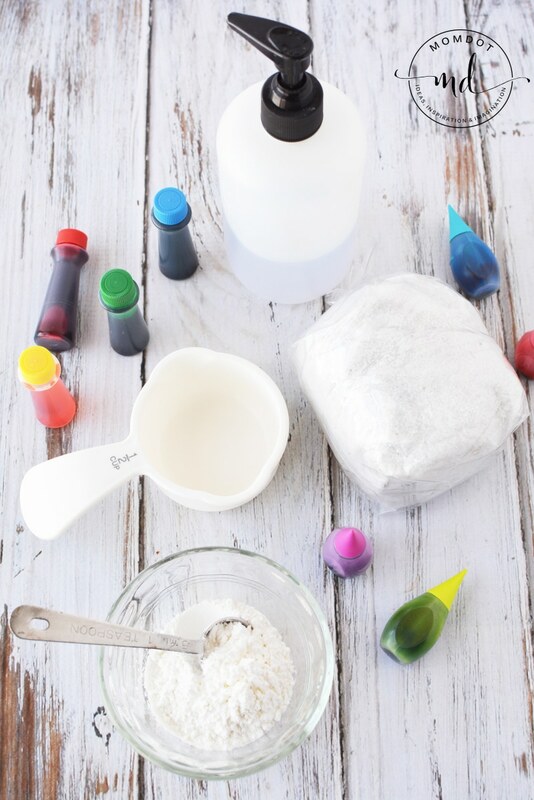 I also love the Wilton’s Performance color if you want to get creative, and I use that in all the how to make slime posts here. My sand came in 24 oz bags and I was able to do 3 colors with that weight of sand. I also used a clear hand soap vs a blue or yellow liquid dish washing soap so it didn’t mess with my colors. How do you make Kinetic Sand? Add sand and corn starch together in a bowl and mix well. In a small bowl, add water and hand soap, mix well. Add color to sand mix and mix well. 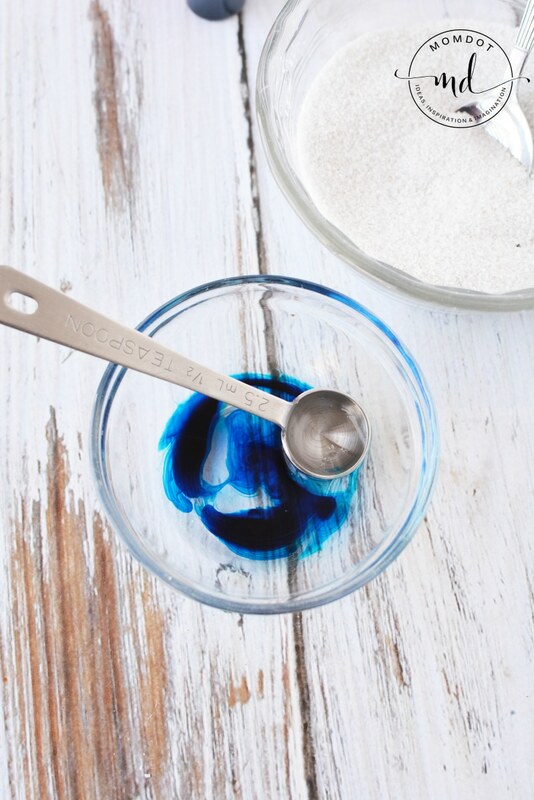 At first you may want to add more water, but avoid doing this until the sand is well mix and the color is distributed. You don’t need a lot of water, but feel free to add more if you prefer a runnier sand. Once you have your sand mixed, place it onto a small plate or shallow dish to dry to the point that you would enjoy playing. Update: Please note that the consistency of what you like for play time changes per person, similar with slime. You can alter this recipe to add more water, less water, more sand, less sand- this is part of the science and fun of play time. If you feel the recipe is too dry, add back water 1 tsp at a time. DRYING TIME: This type of sand will dry out at some point. Dry sand is great for STORAGE. To get your sand back up to play time, just add a bit of water and mix back up. Many people want kinetic sand that is more moldable and dries out less. Like slime, sand is often a preference on how you want it to feel. If you want a more moldable sand, instead of soap and cornstarch, use 4-5 cups of sand, 3 cups of flour or baby powder, and 3/4th cup vegetable oil (adding more oil as needed). Repeat for the desired number of colors. Enjoy getting creative? Try Saline Solution Slime or some Water Gun Tye Dye! Where to buy Official Kinetic Sand? Want to skip the making and just do the buying? I do that too! Pick up Kinetic Sand and Kinetic Rocks here. We LOVE the rocks! mine turned out grainy when I put it on plate to dry for 2 hours. how does it or when does it stick together? Molly, it could be that when making the recipe, I over saturated the sand (after all…experiment and kids!). If you give me a few days, I’ll redo this recipe and make sure that I am giving you the exact time you need and update if needed. For now since you have the sand prepped, you can add back water for play time. 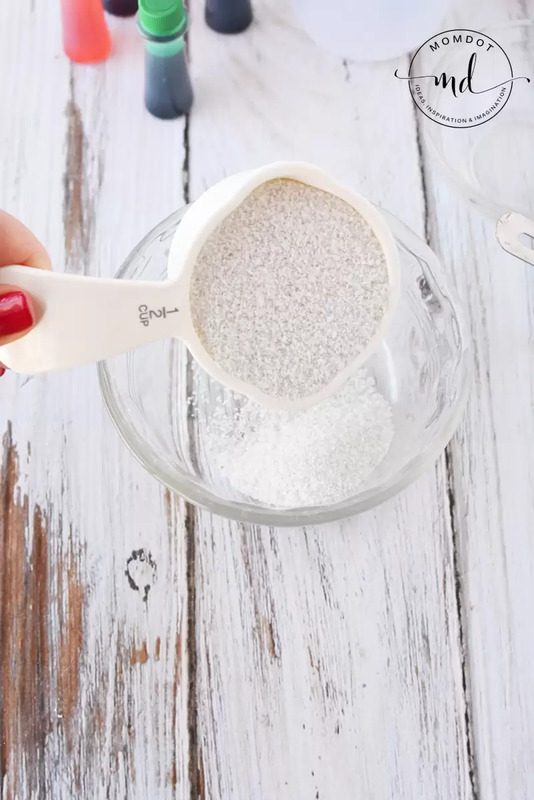 Additionally, you can make more moldable by taking approx 6 cups of sand, 3 cups baby powder or flour, and 3/4-1 cup oil (oil can be adjustable) and blend well. This should allow you serious play because the oil doesnt dry out as much as this type would with a water and soap base. I will be out of town the next few days, but I will test this weekend and be more detailed!